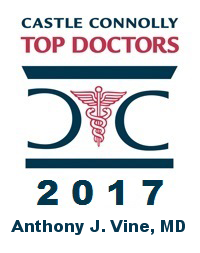 Anthony Vine is a laparoscopic surgeon in New York City. 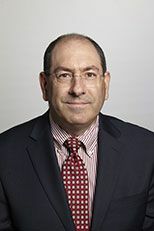 His education and training have taken him from Phillips Academy and Princeton University to Vanderbilt University School of Medicine, with Surgical Residency at The Mount Sinai Hospital in New York City and a Fellowship at the Massachusetts General Hospital in Boston. His special expertise in laparoscopy includes: GERD and other esophageal diseases (Achalasia, cancer), hernia surgery, colon surgery (cancer and diverticulitis), and Inflammatory Bowel Diseases (Crohn’s and Ulcerative Colitis). In addition to being a long-standing Castle Connolly NY Top Doctor, his accolades include selection in both NY Magazine’s Best Doctors and The New York Times Magazine Super Doctors Issue. Additionally, Dr. Vine continues to play his violin in both professional and amateur settings. While at Andover, he studied at the Longy School of Music with Dr. Paul Roby and with Gerald Elias of the Boston Symphony Orchestra. At Princeton, his teacher was Geoffrey Michaels, laureate of both the Tchaikovsky and Queen Elisabeth competitions and whose teachers at Curtis were Zimbalist and Shumsky. During his surgery fellowship in Boston, he was concertmaster of the New England Conservatory Chamber Orchestra and played with the Longwood Symphony. His string quartet in NYC enjoys donating its time and services to performing in hospitals and nursing homes in the “Sing for Hope” Program. For a week during the each summer, he has played in the Verbier Festival in Switzerland. He currently performs with the Roosevelt Island Concert Series in the summer and winter. To make an appointment with Dr. Vine, please call his office at 212-879-6677.